Some things just take a while to come together and in this case it seems to have taken several months of contemplation, collation, tweaking and stitching to come to fruition. A project, it seemed, that would never be finished as it was put away over and over because of life interruptions. However, the vision burned along with the challenge to bring a sketch to life and heed the call of the sea. Her singing and beckoning fuelled such a desire to be on a sandy shore caressed by the breeze, lungs filled with her bracing and healing salty air. see nature in a different light and aspect. What impressed at first was the sound of the sea; it was so much louder than remembered and so powerful, even in the quieter moments. Of greater impact was the stunning light and the shimmer on the waves. At times the sea was pure molten silver. At others the soft rosiness of a new dawn that blended into the sky to make a vast, infinite ocean of light . The sea had so much to share and just looking became an adventure in itself. Walks on the beach always bring to view objects of interest and fascination. To some it may just be debris and grit but to me it presents endless intrigue and curiosity to be investigated, noted and mused upon. This little cove had lots of small pebbles, of every colour ranging from white, red, yellow, blue, grey and black. Some were patterned with whorls and specks. They lay scattered by the tides and glistening on the shore intermingled with froth and strands of weeds and some shells. The patterns formed mosaics on the the sand and were stunning. I loved the way that footprints meandered and blurred alongside and between . Further along the shore driftwood looked like carefully placed organic scupltures among dense bundles of rotting seaweed. On the higher sandbanks panadus palms, gums and vegetation with creepers and flowering vines among the sparser grasses closer to the shore. As yet there is a lot more to reveal, to share and to create. But for now it is time to reveal the finished article, a tiny island that is a refuge for two little mermaids who are playing in the sea and on the shore. 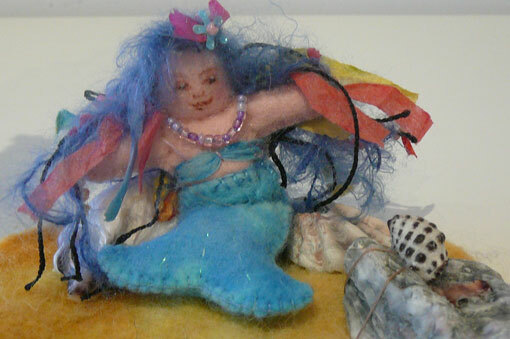 Incorporated into this feltscape are sea shells and a little turtle button carved from bone. Along the edges of some of the waves there is some handspun yarn that has some silver highlights. The waves are layered to give the effect of motion and made from hand-dyed felt, edged with raw wool fleece to indicate the froth. 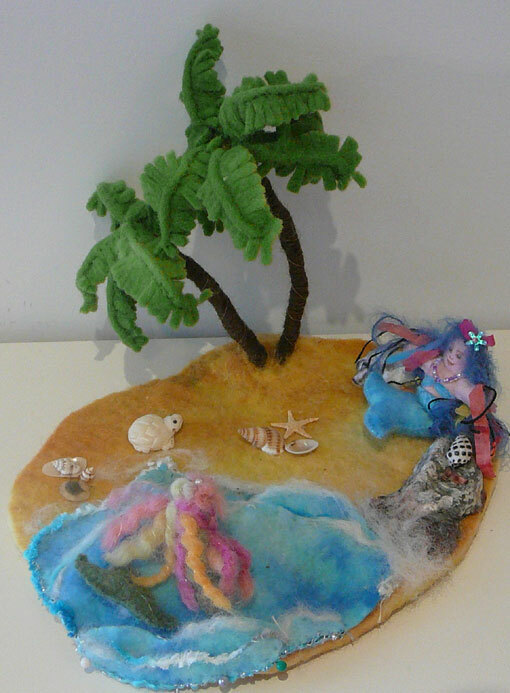 Those palm trees seemed to take forever to make as each frond is handstitched to wool wrapped pipe cleaners. The trunks are formed from several pipecleaners twisted together to strengthen and again wrapped with wool yarn. years ago. 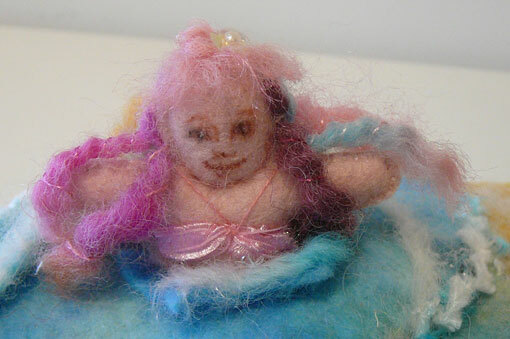 They are made from hand- dyed felt, embroidered and embellished with metallic thread and beads. Their features are inked. I feel that I could improve on these so perhaps another mermaid scene will evolve in time. What utterly delighted me was that when we arrived at the coast we could glimpse a little island out to sea from the balcony of our unit. This piece was already in the making .The view helped to keep the project going so that it was not placed into that murky realm of U.F.O’s.